A Sheffield man is set to be sentenced for sexually assaulting a police officer who was called out to his property. Luca Jelic, aged 29, of Scotland Street, was found guilty of sexual assault, three counts of criminal damage, possession of a Class A drug and assault after a trial in October last year. Judge David Dixon is due to sentence Jelic for his crimes during a hearing at Sheffield Crown Court tomorrow. 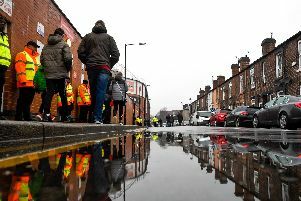 The police officer Jelic assaulted told jurors how Jelic began groping her while she and her colleague were on the floor, attempting to restrain him outside a block of flats in Scotland Street, Sheffield city centre on April 27 last year. “As soon as I would get one of his hands off my crotch area, the other one would replace it. He continued that behaviour for what felt like a long time.” “He made sexual comments throughout the incident,” she continued. When the two female officers arrived on the scene, they found Jelic naked from the waist down, brandishing a For Sale sign at them, the court heard. He was under the influence of the Class A drug, MDMA, at the time of the offence.